Daphne Todd has the unusual distinction of having been awarded First Prize of the BP Portrait Award at the National Portrait Gallery, reputedly the most important portrait prize in the world, which had an international send-in of over 2000, in 2010, after having won Second Prize (when it was called the John Player Award) back in 1983. 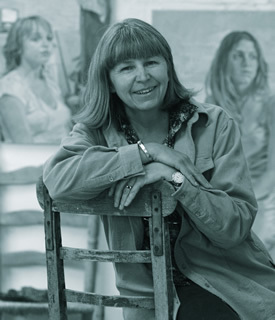 In the meantime she was elected the first female President of the Royal Society of Portrait Painters (1994-2000) and was awarded an OBE for services to the Arts in 2002. Early in her career, Todd had three works selected for the Critic's Choice Exhibition by the art critic for the Daily Telegraph, to hang alongside work by Michael Andrews, Graham Sutherland and Lucien Freud. She is perhaps best known for her portraits and currently has four in the permanent collection of the NPG, (Sir Christopher Ondaatje, Spike Milligan, Lord Sainsbury of Preston Candover and Dame Janet Baker) and a portrait drawing in the collection of HM the Queen, but, having studied at the Slade School of Fine Art as an undergraduate and postgraduate, she considers herself simply an analytical painter of the seen world. Her landscapes, still lifes and figure studies are exhibited at Messums Gallery in Cork St, where she has had 4 solo shows since 2002. She is a Trustee of the Heatherley School of Art in Chelsea and an Ambassador for East Sussex, where she lives on a small farm. Although her studio is a large converted barn she very often travels to her sitters and enjoys exposure to new terrain. A book about her life: Paint and Principle, by Jenny Pery was published in 2008 and is available from the Mall Galleries' book shop. 2001 Messum's Gallery, Cork Street.